As I was sitting here trying to figure out what my next blog post should be about, I noticed (thanks to my Facebook feed) that today is Groundhog Day. While Groundhog Day is a national holiday, and one that usually gets a decent amount of news coverage, I immediately thought of Groundhog Day, the Bill Murray movie, instead. Living with ADHD is seriously just like that movie. This very day is a perfect example. I’m here on the couch binge-watching some random show on TV in the background, trying to make myself decide on a single topic to post about, trying to make myself actually DO IT…and one of my best friends, who is also extremely ADHD, is sitting next to me trying to make herself work on her dissertation. Both of us are pretty paralyzed by the fear of starting and not creating perfection. That fear, in and of itself, is a post for another day (or later today), so I’ll try to stay on topic here. The point is, we have, in so, so many ways, lived this same day so, so many times before. The more I thought about it, the more I realized the comparison was totally spot on. So spot on, that I knew there was no way I was the first to consider it. It just made too much sense, so I Googled it. Turns out, there were plenty of people writing about how the ADHD life resembles Groundhog Day. A man in his late forties posted about his ADHD Groundhog Day and the aching familiarity of associated struggles. Several people commented on that very post, many totally agreeing with, and relating to, the Groundhog Day sentiment. A mom with ADHD noted the Groundhog Day comparison as a common theme in ADHD blogs and described how her struggles were totally in line with it. 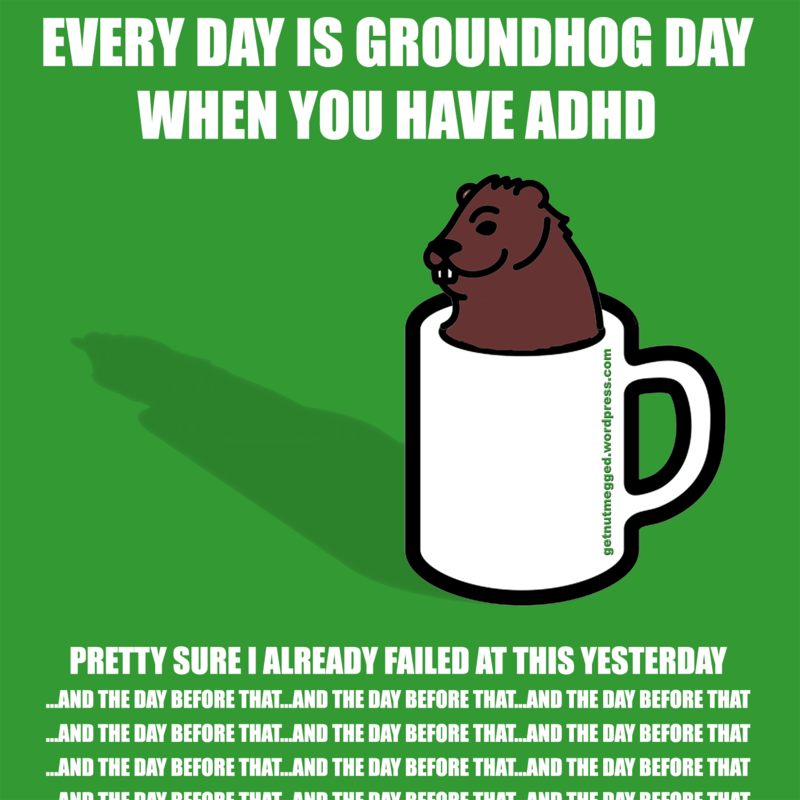 An ADHD coach/doctor talked about how certain symptoms of ADHD always seem to persist, kind of crushing hope, and creating a Groundhog Day feeling. Another ADHD coach discussed the Groundhog Day effect and provided helpful tips for making positive life changes. Obviously this is a common theme among people (adults and kids alike) with ADHD or people who love people with ADHD or, you know, anybody affected by ADHD in general. As I mentioned in my first post, the world isn’t structured in a way that’s suited for the ADHD brain. If you have ADHD, chances are you’ve spent a good deal of energy trying to, often unsuccessfully, find ways to fit your out-of-the-box self into this pretty rigidly structured world. These are just a few of the things we ADHD-ers tell ourselves on a frequent basis. A diagnosis of ADHD is helpful because it tells us that there really is a reason we’ve been having so much trouble keeping up with the rat race. However, a diagnosis, while helpful, definitely isn’t a cure-all; nothing is. Medication, exercise, therapy, education, etc. can help certain people cope with and manage their ADHD. Too often, something seems to work at first and you get super hopeful, but then you wake up one day and you’re back at square one. It was one thing to struggle as an undiagnosed child, adolescent, even young adult with ADHD because everybody else around you was struggling to find their own way and grow up, too. As an adult with ADHD, it can be really painful to look around knowing how hard you’ve tried and seeing that you haven’t really gotten that far. The same stupid issues seem to always find their way back to the surface, no matter how much of a roll you seem to be on. It can be really frustrating. Your past is decorated by a lifetime of failures, not the professional, familial and various personal successes of your peers. There are so many basic life skills that you struggle with, that seem to come so easily for everyone else. It’s not like you haven’t tried a million different things to try and fix your persistent issues. You’ve tried so much you don’t even know what’s left to try. You’ve spent decades problem solving things that most people never have to think twice about. …oftentimes to no avail. But you pick yourself up and dust yourself off…because that’s what you’ve always done. As someone with ADHD, you owe it to yourself to figure out what works for you. Once you figure that out, you can start implementing those tactics that work, so you can get busy being awesome. It will likely be a long road, at least for certain things…and it probably won’t all sort itself out at once. You’ll have to stay in survival mode for a little while longer, meaning you’ll probably have to live through quite a few more Groundhog Days. The world won’t stop for you to be able to figure out what works for you. It’ll just keep spinning…and you’ll keep spinning with it. You have to keep living the best you can until you can find the solutions that truly fit with your brain. Be proud every time you discover a new solution, even if it seems insignificant. Solving a small problem will actually clear out a decent amount of real estate in your brain. And with that new real estate, you will be free to focus on whatever you want. People with ADHD have to keep learning and relearning basic living skills and we usually have to try a lot of different things before we get it right. This doesn’t make us any less than our “normal” peers. To be fair (and unbiased), it doesn’t make us any better than our “normal” peers either. It just makes us different. And there are definitely some things that come easier for us than for them. Once we conquer the day-to-day living skills, we can embrace those things, that we’re innately good at, and get on with the business of saving lives (or whatever it is that floats your boat). Hang in there. One day you’re gonna wake up and it’ll be a new day…and it’ll be awesome. I mean, seriously, Groundhog Day can’t go on forever, right? Thanks for reading! I’m glad you liked it! I included the link where I found that post, if you want to check it out. Either way, thanks for confirming my thoughts about every day feeling like Groundhog Day for those of us with ADHD! I’m glad you’ve come up with some solutions for losing things and for not being late. There are a LOT of options out there, but it’s a matter of figuring out what works for you…and not losing your mind in the process. Congrats on hanging in there and fighting the fight until you figured out what works for you! Keep up the good work! I totally agree about the “Smartphone!” I’ve actually been working on a post about how the “Smartphone” has simplified so many tasks and how its functionality is so congruent with the way the ADHD mind works. That is probably the best article I have ever read on ADHD, I am 57, and was only diagnosed 4 months ago…this has been a struggle, trying to come to terms with fixing this, and thats part of the problem, I cant. 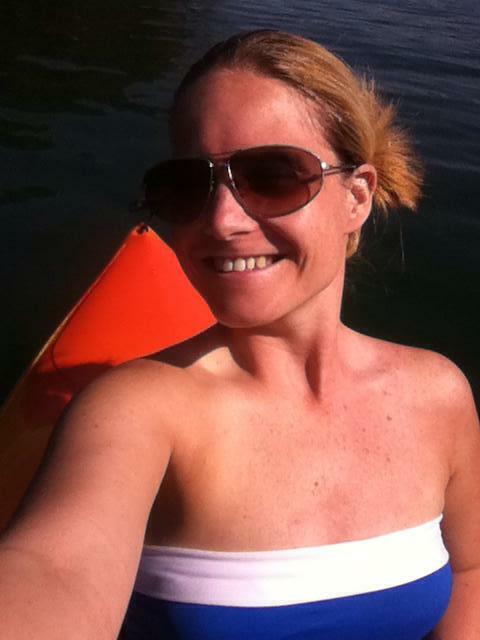 I realized I have been looking for that system, that program, that thing that will allow me to move forward and not have any more of these day after day issues. At least now I know why, I am the way I am…does not make it any better, in fact some days worse. Some days my hyper focus is so intense, its hard to get anything done, those are the days, I go take my 2 mile walks, I can walk so quickly now, that my fitness app says I am jogging, as my pace is under a 12 min. mile walking. Anyway thanks for the article, it gives me a little more perspective. Thank you so much for all of your kind words! Obviously, I haven’t kept up with the blog as much as I would have hoped to. I did for a while, but then petered out (as we tend to do). Your comment here is a reminder of why I started writing in the first place. I wanted to reach people. I wanted to find other people with the same gifts and the same struggles and I hoped to find common ground together and I hoped we’d find ways to get through and succeed in spite of (AND because of) the tie (ADHD) that binds us. Thank you for that. It’s day to day, for sure, but the more you learn about yourself, the more you can figure other things out. I’m rambling now. And I’ve fallen silent for so long mostly because I’ve felt super lost myself. I guess everybody has their good days and their bad days. Hang in there, friend! Thanks for stopping by and reading…and, most importantly, for taking the time to share your story.